DJ Super Friends vs Sydney’s Number 1 Dancehall Party in a full venue take over of Goodgod Small Club! In the back…HOOPS DJs – NINA LAS VEGAS and BAD EZZY will be bringing a mix of up to the time club music and general fun times. In the front…DUTTY DANCING SELECTORS – SHANTAN WANTAN ICHIBAN, NICK TOTH, BASSLINES, & MIKE WHO will be serving up a HI NRG dose of electrified dancehall reggae. PLUS SPECIAL GUEST…JUBILEE (NYC / MIXPAK) – One of the most diverse club DJs out, Jubilee will be playing across both rooms. 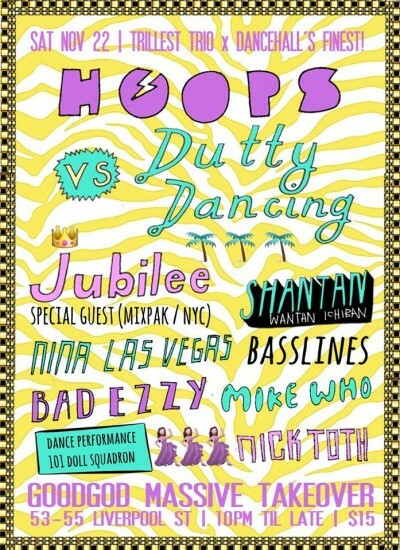 Jubilee is known for a mix of grimey miami bass, tropical beats, dancehall anthems and hip hop stompers.